Thousands of school pupils are on a mission to get rid of litter from where they live. Litter's a problem in the UK with more than 2.25 million pieces being dropped every day. Animal charities receive thousands of calls about wildlife harmed by rubbish left where it shouldn't be. There always seems to be a new challenge that goes viral but this one is doing a lot of good at the same time. 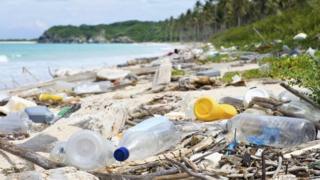 In the Trashtag Challenge, users pick a place filled with litter, clean it up, and post before and after pictures. Thousands of people have taken part in projects making beaches, parks and roads litter-free and raising awareness of the amount of litter we produce. Recently the British sailing team joined forces with hundreds of sailors from all over the world to raise awareness of plastic pollution ahead of a major regatta . 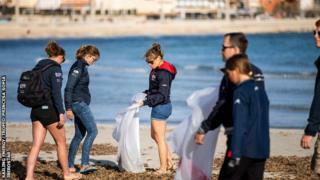 The sailors, coaches and support staff took to beaches on the Spanish island of Mallorca to pick up rubbish and collected dozens of sacks of rubbish. One girl getting other people to help her to tackle the issue of litter is seven-year-old Elizabeth. She's been organising monthly litter picks at her local park. Elizabeth's made lots of friends through her work and her message to others kids is "together we can make a difference." Ella and her mum decided that while they paddleboarded in Devon they'd also pick up the litter they saw along the way. They've found plastic bottles and bags, and also some more surprising items like gloves, footballs and even shoes! The pair note down where the litter hotspots are too so that others can get involved and help the clean-up too. School girl Ivy was fed up of treading in dog dirt on her way to school, so she decided to do something about it. With the help of her mum she created 'poo bag dispensers' and attached them to lamp posts near to where she lives. So when owners are out with their dogs they have no excuse not to clean up after their pets because the bags are right there! That is awesome that everyone is helping. Them numbers were outrageous. 2.25million?? ?